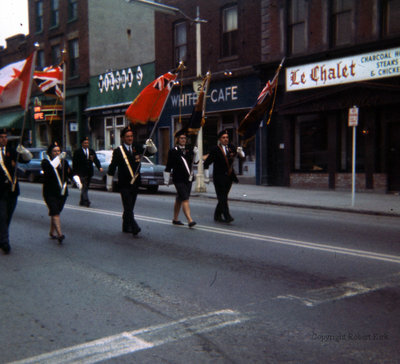 A colour photograph of the Remembrance Day procession walking east towards the Cenotaph on Dundas Street East. This photograph was taken just before the intersection of Brock and Dundas Streets. Remembrance Day, c.1968, Robert Kirk. Whitby Archives D2013_011_017.